This weekend saw two Tesla milestones: the grand opening of Tesla’s Silicon Valley store (which we attended, snapping these photos), and the delivery of former Tesla CEO Martin Eberhard’s founder series Roadster. Eberhard finally getting his car has important significance — the car had been accidentally crashed during a test drive, and the damaged car was a symbol of the animosity between Tesla Chairman Elon Musk and Tesla founder Eberhard (chronicled in that well-read Fortune story). 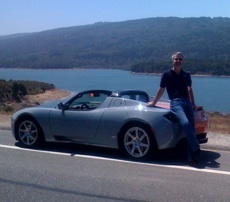 But on Saturday Eberhard finally received his car and wrote a post about his experience on his Tesla Founders Blog. He took his “gray and orange beauty,” for a spin down to quintessential Silicon Valley breakfast joint Bucks, and “the Roadster was made for the twisty bits and brief straight-aways of Skyline Boulevard and La Honda Road,” he wrote. What a joy! There is absolutely no car in the world that passes a slow poke the way a Tesla does. Never-ending torque, instant response, nimble suspension, tight steering. True to form, Eberhard’s post is also laced with the hard feelings that led up to his departure from the company he founded. Eberhard points out that the company delivered the car on on the same day as the Menlo Park store launch but decided not to publicly present him with the car. This Roadster delivery should have been high-fives around, break out the champagne, party and keep the cameras rolling. What a great way to open the Menlo Park store this would have been! Instead, this delivery was a subdued affair – Doreen and I sat on a garden bench and went through the paperwork. Image courtesy of Tesla Founders Blog.